There is an old expression, to hat someone up, which means to send them on their way; it derives from giving people their hat when the time has come for them to leave. 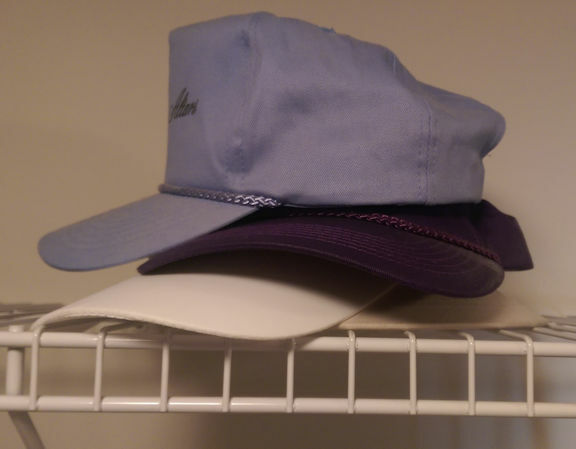 This week it came to mind when I looked up at the top shelf of my closet and noticed a stack of hats that I used to wear for gardening and other outdoor activities, to keep the glare out of my eyes. I realized that those hats had been sitting there gathering dust for years because I now prefer to wear prescription sunglasses instead of hats on sunny days. It’s all too easy for closet shelves to fill up with stuff that once was useful, but hasn’t been touched in ages. Sometimes it’s because of a conscious decision that it might one day be useful again; but more often, it’s simple inertia because the stuff has been there for so long it doesn’t even get noticed anymore. However it might happen, that clutter just needs to get hatted up! Oh, I know. But I don’t have hats, more than one that I use when hiking on extremely hot days. But there’s other such stuff, once useful. Particularly clothes that I have a difficulty to part from…just in case. But a year later they are still there, not used even once. I need to get much better at cleaning them out. Yes, all that once-useful stuff, it’s everywhere!